I'm using MTC for more than 2 years. I'm waitting for two inportant improvements but is not implemented yet. Some one knows if it will be available in the future? Is possible to connect the KNK with another software? @sderamon - at this time Bryan (the gentleman who hosts the weekly webinars) will neither confirm nor deny that there any future developments for Make The Cut!. That said, there is a long list of items on the Wishlist! that have been there for years, so who is to say that any new development would include some, all or none of those items. KNK has an older software product that worked with their older cutters, I don't know if it works with current cutters, but I vaguely recall that it does. That software hasn't been updated in years either. You can't use that software with the Zing. Inkscape has a plugin that does work with the Zing. Inkscape is free. Just discovered that SCAL4 works with Zing. @dedethom, Did you actually test it? For sure, SCAL has never notified KNK USA that it works with the Zing. Yes I did Sandy. Works pretty well. Still buggy though. I hope it won't be another Cricut adventure. What cutter are you selecting to cut with? 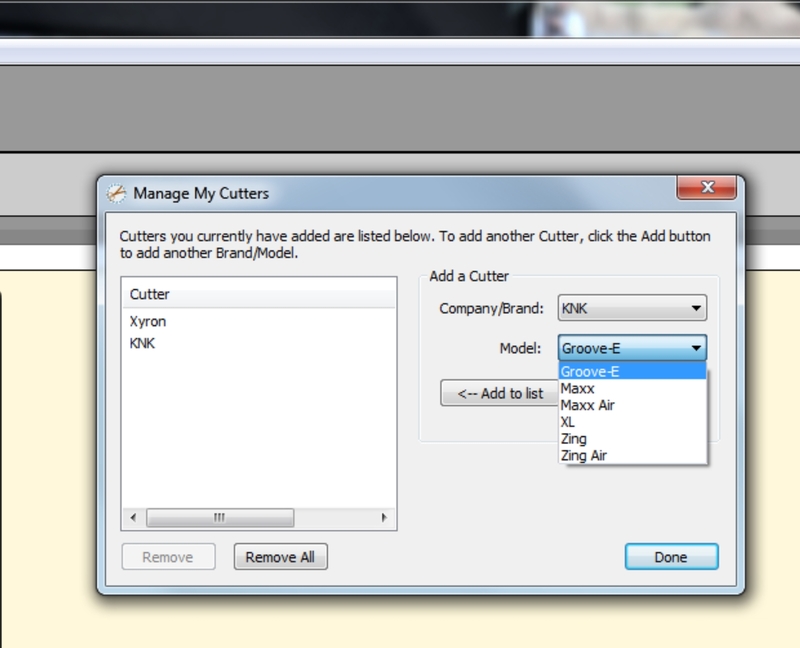 Like Sandy, I didn't think it offered an actual option for the Zing or any other KNK cutter. I tried it and it works but I can't figure how to set the origin for the ZING. I had upgraded my SCAL so that I could export fcm for my SnC. This will be a bonus. It did cut well. Still love my MTC the best!!! Interesting :P I have no idea when this happened or how they work. The last conversation I had with Brandon was years ago. Oddly enough, I've never had anyone contact us in regards to this implementation. @ChadatKNK...On May 19, 2015, Craft Edge posted on their forum "SCAL4 will work with the KNK machines." You would think that they might let KNK know! Well, I'm glad we're not finding out six months from now! I noticed that they don't have the KNK's listed on the web site when purchasing SCAL. Anyhow, I went ahead and upgraded to version 4 and tested it on both the Zing Air and the Maxx Air. Both would readily work via Bluetooth. And all three cut modes worked. I plugged in my laser calibrations for both cutters directly into SCAL and the PNC's were spot on. Note that you don't have to enter the Y value with a minus sign. Also, when you're moving the laser light, the up arrow on your keyboard moves the light up (and the down arrow moves the laser light down). It works the other way in MTC and also in KNK Studio. You have to press the down arrow to move the light up. So, that's kind of cool since I've yet to meet/help a customer who didn't always think that it should work the other way and struggled to get it right the first time. The only issue with PNC's was that I couldn't figure out how to change the "up speed". It was way too fast on the MA and way too slow on the ZA. I also couldn't figure out how to set an origin on the Zing Air, so I'm guessing that's not available. That's a bit problematic since you need to move the head to the left when setting the origin with almost any cut on the mat, at least in Knife Point mode. I noticed that one can cut by color, which has often been requested by those using MTC. Same for being able to work in metric (display size in cc or mm and have custom metric mats). There's also a true Mac version, but it appears you have to buy it separately if you want to use both a PC and a Mac. Personally, I'll continue using MTC because it meets my needs and the majority of our customers truly love it, as well. But I can also understand that those who are more comfortable with metric might want to try SCAL. @SandyMcC - thanks for your review of SCAL and its ability to cut to KNK cutters...very interesting!! You're welcome, @Liz_A. I only spent about an hour testing things, so it's not much of a review. But I did want everyone reading this thread to know that I'm checking it out. I have to thank @dedethom for bringing this to our attention. And thank you, @Rorysnonna, for your input as well! I hope to play this weekend at some point to figure a workaround for the origin. I would also love to haul out my XL to see how it works with that machine. I still have not tried the PnC so I have that on my list too. We have a wedding in the works here at home so between invites and favors I need all the machine power I can get! Thanks for all the testing you do. If I could be a programmer I would make a cutting software that combine the best of both software to make a super MTC. I love MTC for what I've been able to try but I miss a lot of features that are available on SCAL 4 or even Silhouette designer edition. Unfortunately I'm not that good in programming ;-( I saw in another thread that people would be interested to pay for a Plus version of MTC. I sure would too if it could incorporate the missing features that MTC has and that are wished from many users. Come on : bring to front, send to back; marquee zoom; faster speed; zing air driver less futuristic. I notice that people found 'workaround' for most of those requests but... I would pay up to $19.95 for an upgraded version of MTC that would include those features and more. That's my point of view. Based on the pricing of other software, I would be willing to pay $79.95 for a Pro version of MTC, and to upgrade the current MTC I'd be willing to pay $19.95 as well. @bettinperth - thanks for that information...can you share the download link, I am sure that @SandyMcC would love to test this new version! This is the link I was sent for the version that has the origin tab....works well !!!!! Thanks, Bett! I'm "all over this" tomorrow. Fortunately, I have a clear schedule for testing. Sandy, are you using SCAL 4 or SCAL 4 Pro? I saw where SCAL PRO 4 IS $199. I'd gladly go up to $100 for a good upgrade to MTC! I do not want to learn a new software and love it the way I do MTC...lol. I'd rather stick to MTC so what's a crafter to do? Oh and I forgot I want the parts of MTC I know how to use to be left alone..lol. I figure I can add that cause nobody is listening to me anyway! I'd love to get the cutting presets, overcut, and end action options on MTC. SCAL now has a feature to export a file in Brother Scan n Cut format (.FCM). I'd like to see this in MTC.